As cats enter their golden years, their dietary needs change. Their digestive systems slow down and their organs may decline rapidly. Health issues overlooked in their younger years will manifest. Along with the proper veterinary care that a geriatric cat would need, a revitalization of the diet will prove effective in prolonging her nine lives. 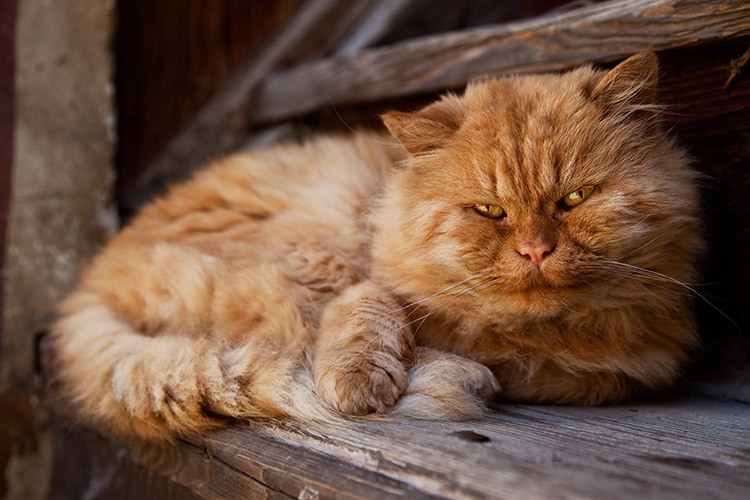 Any person who has had many cats will know they are prone to kidney, bladder, and urethra problems. This set of problems is exacerbated with age. Unfortunately, it is often difficult to ascertain that a cat has a health issue. Those issues that may have been hiding in their younger years will become apparent in a senior cat. A food low in phosphorus is needed to prevent kidney failure. Look for a specific packaging that states the food is designed for cats with kidney disorders. As bladder stones and blockages in the urethra are commonly suffered by cats, many pet food brands provide varieties low in magnesium. The low-magnesium food helps to prevent further crystals from forming. Kidney and bladder problems can either be caused or aggravated by insufficient water intake. Making sure your cat drinks enough water throughout her entire life is one of the most important things you can do for her health. If your cat is reluctant to drink water, you can feed her a wet-food diet, adding a few more tablespoons of water mixed in for good measure. The house cat has a stress-free life usually consisting of sleeping and eating. Humans have gotten fatter and so have our pets. Domesticated cats, with their lithe physiques, have not escaped obesity and the added weight causes their joints to deteriorate and their organs to weaken. Obesity can bring about an onset of diabetes especially for an older cat. If you have an obese senior cat, a vet visit and blood tests will determine how healthy your cat is. After your vet has results back, a diet can be tailored for her. Special varieties of cat food aimed at senior cats decrease the calories and fat in their diets while providing the protein they need. Senior cat food will also be easier on their aging digestive systems. In addition to a lower-calorie diet, you may need to restrict their portions. Free-feeding house cats is usually not necessary – doling out measured portions twice a day is a good way to count their calories while getting them on a schedule. Extra vitamins are usually not needed and can even cause harm. Vitamin supplementation can worsen kidney and bladder problems, even causing stones to form from the excess minerals. Remember that most pet foods are designed to be balanced, eliminating guesswork and human error in feeding pets. Senior pet foods are made to provide 100% of an older cat’s dietary needs, so vitamin supplements shouldn’t be necessary unless you’ve been explicitly advised otherwise by your vet. Cats don’t need a huge amount of water but when they don’t get enough it can be disastrous. For a senior cat, dehydration is even more severe. Always leave a bowl of fresh water for your cats being careful not to place it near their litter box. Try to monitor their water intake. If you know they aren’t getting enough water, you will need to permanently change their diet to exclusively wet food. A dehydrated senior cat needs immediate medical attention. Your vet will either administer saline by IV or by injecting it underneath their skin. The house cat, with regular medical care, can live for 20 years. The oldest age ever recorded for a cat was a staggering 28 years! Your senior baby probably won’t beat that but she only needs an ounce of serendipity and only a little more TLC than a spry youngster to give you those precious years of companionship in her old age.